Here at WordPress.com, we love blogs. We love bloggers. And more than anything, we love bloggers who blog. You’re the bee’s knees. The cat’s pajamas. The apples of our virtual eyes. We’re bloggers too, so we know that signing up for a blog, picking a theme, and getting your site set up just the way you want it is the easy part (no, really!). Figuring out what you want your blog to be, coming up with regular posts, and finding your niche in the ever-expanding blogosphere – that’s the toughie. You picked out what the Daily Post wrote? Bloggers are enthusiasts. iNotes4You is completely without any commercial purposes. WordPress may place some ad in non commercial blogs but they do it, I think, only if the blog has thousands of readers every day. iNotes4You is far far away from this tremendous number of readers. Bloggers need food and the food are interesting connections all over the world. This is the moving power to continue. Why did you fly into the blogosphere? There are many reasons which make blogging so satisfying for me. But the main point is to get contacts around the world no matter of country, religion, and color of the skin, exchanging information, and opening the mind for different opinions. My profession is to develop Microsoft Access databases. Even if you are no developer you may know that programming is a very hard job with the focus on a flat screen and text which is far far away from poetry. I do it since more about 35 years starting with Z80-based computers. I think younger readers of my blog don’t know anything about this dinosaurs of heavy electronic machinery. The Sharp MZ was a series of personal computers sold in Japan and Europe (particularly Germany and Great Britain) by Sharp beginning in 1978. 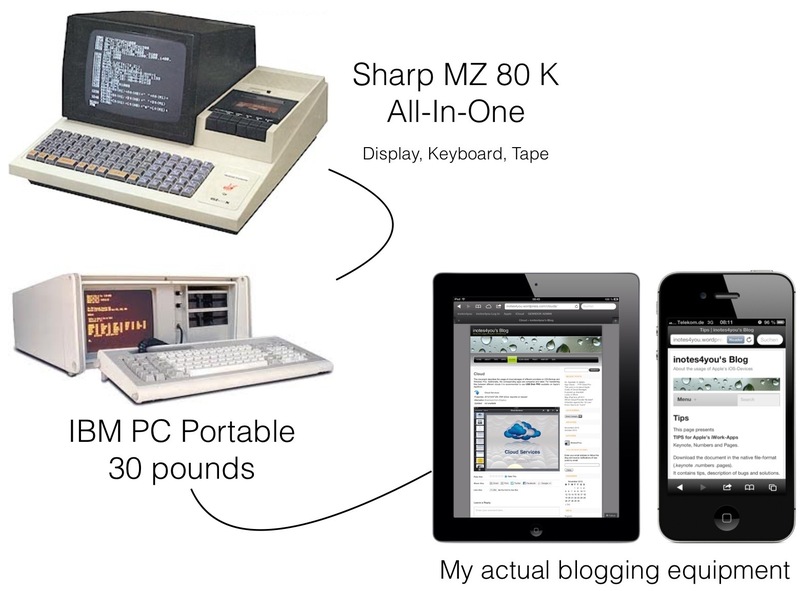 The MZ 80K was my first machine and it offered a real alphanumeric keyboard (the previous model had a hexadecimal keyboard) and an well-known audio cassette as the ‘mass storage’. It was one of the popular early consumer-level microcomputers, with an architecture based on the Zilog Z80 8-bit microprocessor with 48KB (in words: forty-eight kilobyte; it’s the number following 47 and preceding 49) with 32KB available for user programs. It could run a variety of high-level languages including BASIC, Pascal and FORTRAN, which had to be loaded via tape into RAM before any programming could be undertaken. So you might understand that blogging today on an iPad and an iPhone is a cushy job. Al that began when buying my first Apple device, an iPhone 3GS. To discover all the features of this small device is amazing if the old heavy machinery is still in your mind. It’s like a virus but a completely unknown species because it’s inspirational. I would appreciate if you deliver the medicine to survive the Apple virus. You can do it by sharing and commenting. 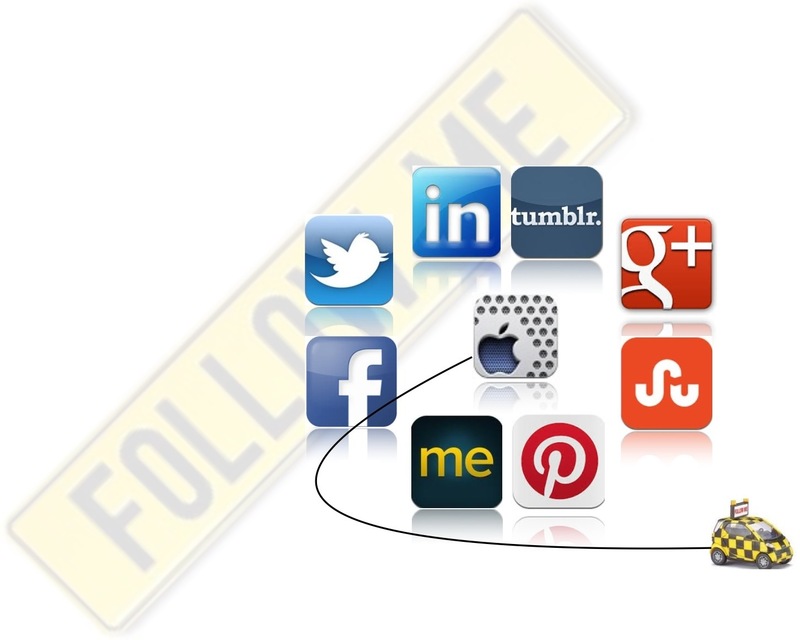 Here are my social network contacts where you can share and comment. Well, these networks are supported by WordPress and I know that there are different preferences to share content. So nearly everybody is served.